This contemporary 2 bedroom vacation home rental penthouse sleeps up to six people. The master bedroom has a walk-in closet and king size bed, the second bedroom has two twin size beds, and there is a futon in the living room that comfortably sleeps two adults. The kitchen is fully stocked with all the necessary appliances such as refrigerator, stove with oven, utensils, microwave, coffeemaker, blender, toaster and drinkable water. The dining area has seating for six persons and there is a satellite TV and DVD player in living room. The dining/living room area opens up to a furnished balcony overlooking the pool. The large rooftop terrace is complete with hammocks, Jacuzzi, seating for four persons and a charcoal grill. 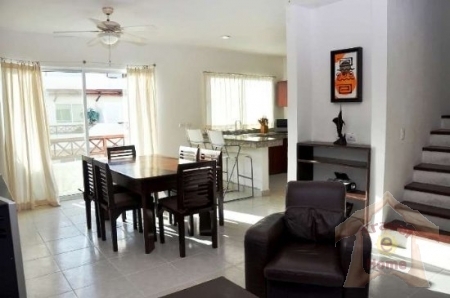 This third floor holiday home rental is located within the gated condo development Margaritas 2 and is complete with a swimming pool and 24/7 security. It’s located on 20th Avenue and Constituyentes Avenue (near the large grocery store Mega) only 6 blocks from the beach and 4 blocks from the famous 5th Avenue with all the shops, restaurants and nightlife. 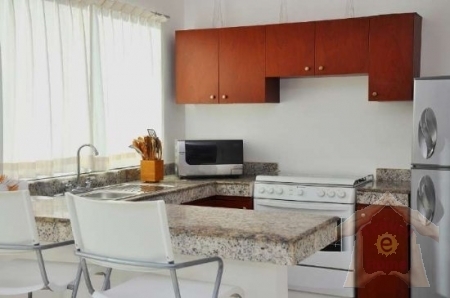 Book this 2 Bedrooms Condo which Sleeps 5-8 in Playa del Carmen Vacation Rentals in $155/Night* NOW!! !